It is all too easy to watch news bulletins and feel exasperated by the images of violence they portray. I regularly encounter the common perception that we are living in unprecedentedly violent times. It just ain’t so! 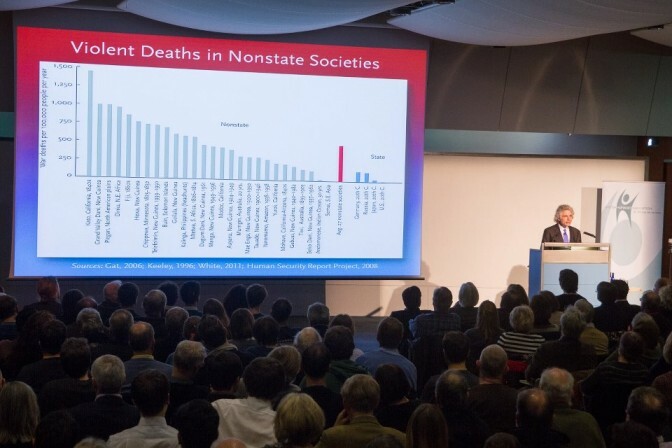 The 2013 Voltaire Lecture was given by Professor Steven Pinker and was a celebration of the decline of violence that he has identified across the world as a whole, on the back of an impressive body of evidence to support his conclusions. The evidence points to a steady decrease in violence from ancient times to the present day, which can be attributed to a range of factors. Prominent among these is the great advances made in spreading rational thinking and rejecting irrational prejudices. The justifications for violence are steadily being undermined. When you look at a large proportion of the violence that persists, a common denominator often emerges in the form of religious sectarian underpinnings. Voltaire’s most famous maxim was: “Those who can make you believe absurdities can make you commit atrocities”. Show me an example of an atheist/humanist suicide bomber. Pinker concludes his lecture with a call for us to stand up for the things that have made our world a less violent place, as we still have a long way to go. Those things are enlightenment values, reason, science and humanism. These are values largely shared by the Green Party and the vast majority of its membership. This is why I am here. This entry was posted in Uncategorized on April 20, 2013 by Bridgend's Green Leftie. The Coach - Bridgend - the best pub in Wales! Votes for Policies - if you dare!